Markets.com are a leading broker, offering CFD and Forex trading, via their bespoke trading platform. Operating in 15 languages with clients in over 100 countries, and with an unparalleled asset list, they are one of the fastest growing brokers online. The brand is a subsidiary of Playtech, a company listed on the London Stock Exchange, forming part of the FTSE 250. 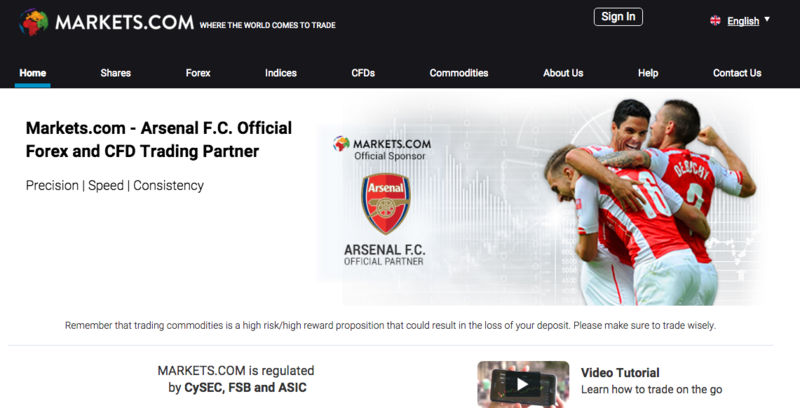 Markets.com is operated by Safecap Investments Limited, a regulated investment services firm authorised by CySEC (under license no. 092/08). Signing up takes just two items – an email address and a password. Traders then get access to a demo account with a £100,000 virtual balance. Demo Account – Yes. Available instantly on sign-up. Offer details – No current deposit bonus. The £25 offer has now ended. Mobile App – Yes. See more detail below. As a CFD broker, Markets.com delivers a trading platform which goes way beyond that of a conventional binary options website. It represents a “step up” from binary options platforms, providing leverage and charting options only available at more established CFD brokers. The feature rich platform does mean an additional layer of complexity, and the management of risk is not as straight forward as with traditional binary options. That said, the trading platform presents trades clearly, and traders can see exactly what leverage they are taking on – and configure it appropriately. The first step traders complete is to find their desired asset. There is a handy search function, or traders can select a category of asset (Bonds, Currencies, Stock, Commodities and Indices) and filter it further via sub-choices, such as ‘major’ or ‘minor’ for currency pairs, or alphabetic grouping for stocks. Scale the charts over any time frame from 1 minute intervals, to 1 month – and expand the time frame that the chart covers. Overlay Technical analysis – Switch on Bollinger bands, or moving averages etc – but crucially, Markets.com give the user the ability to configure the analysis to their own needs. 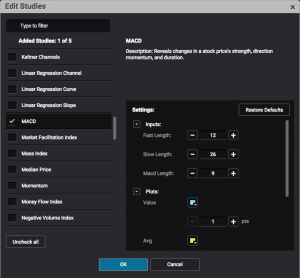 They can set their own moving average time frames – or any other settings (See the screen shot for an example within the MACD feature). The choice of tools is very, very impressive. Configure the appearance – Set the background and colours as required, and turn on, or off, different features such as trade volume or the grid. Annotate by hand – Add bespoke trend lines, channels or support and resistance lines as required. Some brokers provide a very basic chart and almost assume their traders will have done their research elsewhere – not so at Markets.com – they provide some of the best charting and research resources we have seen. To open a position, traders select the ‘Buy‘ or ‘Sell‘ buttons above the graph. This will open a new window where the exact figures of the trade can be entered. This includes the level of investment, the leverage, plus any stop loss or take profit figures that the trader wants to apply. The total value of the security is displayed, just above the ‘required margin‘ – this is where traders need to manage their risk and liabilities. Clicking the ‘Confirm Order’ button will rubber stamp the deal and a popup will appear confirming the order is placed. At this point, the trade will be visible in the ‘Open Positions’ tab – but the detail will also be visible on the asset itself (details of the trade, including the live position, are shown beneath the relevant asset in the asset list) and also in the account overview table, in the bottom left of the trading area. At any point an open position can be edited or closed. The Edit and Close buttons are available alongside the asset in the menu on the left. Clicking either will allow a trader to amend the stop loss or take profit levels, or close the trade. A live ‘Profit/Loss’ tally informs the trader how that particular trade is performing. There is also on overall account window. This displays the consolidated position of the account as a whole, including a balance which includes all open trades. Markets.com offer an extensive range of assets. As a Forex and CFD broker, they offer trading on commodities, stocks, forex and indices – and in addition, they also offer trading on bonds. The search facility makes finding the required asset very easy. Frequently traded assets can be added to a ‘favourites’ list for quick access. Binary options traders may be used to having different types of option available, but at Markets.com, as a CFD broker, they only offer trading via the ‘spreads’. One other note on the trading choice, is that the stock list at Markets.com is dominated by US firms, with not so much attention given to FTSE 100 stocks. 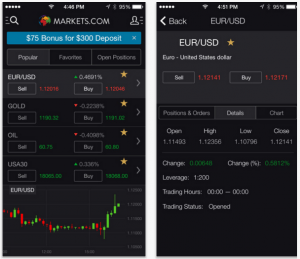 Markets.com provide a free mobile trading app. Applications have been written for both iOS (version 6.0 or later required) and android (version 4.0 and up). Both are very well established with a large number of downloads. Users have rated them at 4 out of 5 for iOS and 3.8 out of 5 for the android version. The application reflects the trading platform at the full site. The full range of assets are available via mobile and the trading mechanism is the same. The display is clear but still displays all the relevant detail and the power of the charting tools remain – though a full screen is desirable for that kind of analysis. The asset search facility remains, and the trade confirmation screen is the same – allowing full use of stop losses and take profit options. Markets.com offer very competitive spreads and zero commission. Spreads are generally very tight, particularly on the frequently traded assets that attract high volume. Leverage can magnify profits and losses, making comparison to binary options payouts irrelevant. Markets.com margins compare favourably with their CFD and Spread betting rivals. Markets.com accept deposits via all the major sources; wire bank transfer, credit cards, e-wallets (such as Skrill and Neteller) and debit cards. Making a deposit is a swift process and those deposits are commission free, there are no fees. Any withdrawals are made back to the same method as the original deposit. Again, there are no fees for withdrawals and they can be made at any point. Traders funds are segregated from the business funds, as per regulation guidelines. Risk Management – Markets.com offer risk management tutorials, as well as additional tools such as the Entry Limit, Stop Loss and Take Profit functions. Real Time Analytics – Up to date charting and analytics, over a range of timescales. CFDs carry risk.73% of traders lose.